By the time you reach this stage in the wedding planning process, your venue most likely has been secured. If you’ve fallen in love with a 10 piece band, the venue may only be able to accommodate a trio. Additionally, you might want to check with the venue regarding any electrical limitations they may have before you do any research on bands or DJs. Pro-Tip: Ask us about adding musicians to a DJ package to give it a “Live Performance” feel. When it comes to price, DJs are typically less expensive than bands. Additionally, bands tend to take more breaks than DJs, so going with a DJ may give you more bang for your buck! Pro-Tip: Studio 27 packages always include music for your ceremony, cocktail hour and the reception. With bands, you may find yourselves limited in terms of style, music catalog, and requests. If you’re looking to hear a specific song by a particular artist, especially for that First Dance, you’re definitely going to want to go with a DJ. Additionally, if you have a mixed crowd of wedding guests, a DJ will ensure there’s something that will get everyone onto the dance floor! Pro-Tip: Submit a playlist of songs for our DJs to play at your event. Dance to the music you love. Our DJs and MCs are not only amazing at pumping up your guests, but are also great at reading the room and ensuring the vibe of your reception remains upbeat, excited, and ready to dance all night long! Pro-Tip: Studio 27 requires a final meeting 30 days before your event to make sure your event rocks! Bands are often limited by the songs they know and play well. A DJ allows you to be flexible with the type of music you want played, as well as being able to adjust the volume so guests can still converse at the wedding. 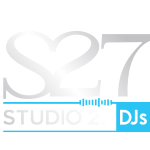 Pro-Tip: Studio 27 DJs are professionals and know how to adjust their volume for your venue’s acoustics. Call Studio 27 at (516) 730-5007 to start the party now.